Recently I started a new job and have had more time to look at how to create architecture catalogues of elements and diagrams for reuse across projects, and realized that a lot of what I’m doing could also be reused by other Government of Canada and related organizations. I’m going to start documenting some of my ideas on this blog, and also share some of the insights from other people who I work with. To start I’m going to share my Meta-Model for how I’ve started modeling out the Government of Canada’s Policy Instruments from the Treasury board of Canada. 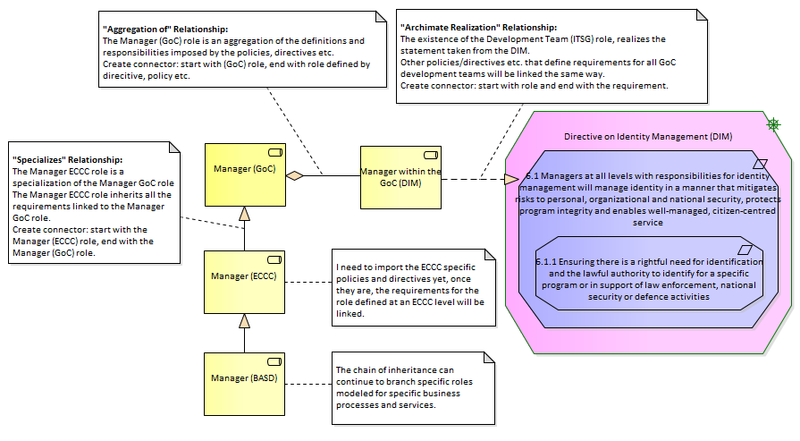 I plan to use the Archimate 3.01 notation as much as possible to support exchange using Archimate Model Exchange Format. I’ll be using Sparx EA (currently version 14) as my modeling tool. The Policies, Directives, Standards etc. were written with a reader in mind, not a modeler. You often have to read multiple statements together to understand the overall context, and in many cases these statements are overloaded to describe or infer multiple Architecture Elements. you need to read 6.1 in order to understand the context of 6.1.1 (and it’s bullets), 6.1.2, and 6.1.3. Reading these statements I can see the following elements that will be needed in my Model to Realize the intent of these statements. The same Business Role, Business Process, Business Object is often assigned new requirements and rules across multiple Policies and Directives. For example there are responsibilities assigned to the Departmental Security Officer under the Policy on Government Security and the Operational Security Standard: Management of Information Technology Security (MITS). The directive identifies additional responsibilities for the DSO. Model as much as I can using a single standard to support data exchange. Use the Archimate 3.01 standard to create the base models, and CSV files to provide extra data if needed to enhance the models. In Sparx EA I’m able to import the source document and then select text in the document directly to create statement elements. If the realizing element from Step 3 connected to a statement that is part of a hierarchy, design reports so that all parents and children of the connected statement are included to give full context. Create a single central copy of each of the Business Role, Actor, Process, Object etc. in my catalogue at the GoC that are related to the realizing elements I created in Step 3 (across multiple sources) using an Archimate 3.01 aggregation relationship. Create a single central copy of each of the Business Role, Actor, Process, Object etc. in my catalogue at the Agency/Departmental Level that are related to the aggregate elements from step 5 using an Archimate 3.01 specialization relationship. The source for the requirements in this meta model is the Directive on Identity Management (DIM). This is my current thinking an approach on how to tackle this. For GoC staff there is also discussion on the GCConnex site for how to proceed, so if a consensus is reached that differs from my approach I’ll post an update.